One of the many nice things about working of the Agricultural Project of the Yayasan Usaha Mulia (hereinafter just ‘YUM Agro’) is that I get to meet the project participants, and to spend time making photographs in the seven villages in which YUM works. (More about the project here). The photographic work is a pleasure for me of course. But it’s also useful for YUM to document and report on their progress, for educational materials and to promote their activities. Lately I’ve been photographing the ‘home garden’ and ‘small animal husbandry’ (chicken) projects. It’s now musim kemarau (the dry season). The rivers are way down, and in many locations there is simply no water available for irrigation, so many of the vegetable gardens are dormant until the rains arrive in November or December. But some other places have permanent (or semi-permanent) water supply, and so gardening is able to continue. In Marang village, Ibu Nursiah is able to keep her crops of corn, beans, eggplant, chilli, tomatoes thriving due to water from a nearby bore. Her bigger problem is soil quality, as the soils in this region consist of mostly sand or peat – both infertile. To grow vegetables requires a big effort to build the soil up with compost, worms, bokashi, manure, and other sources of organic material. 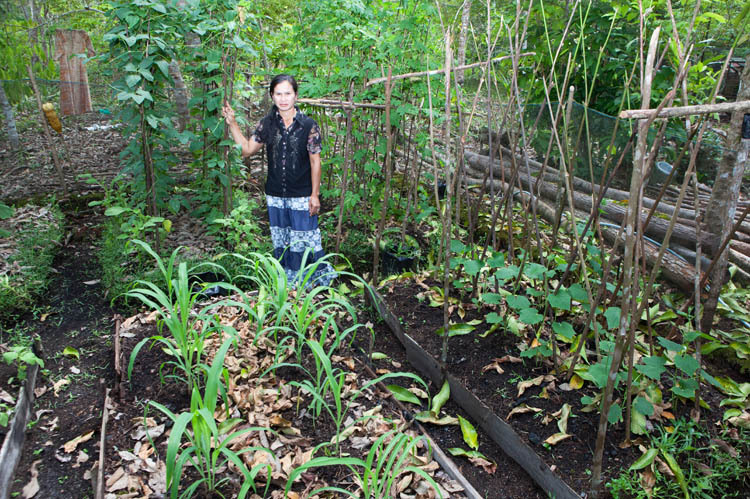 Ibu Yani in Habaring Hurung village, like all 300 of the families that now have gardens established with YUM support and advice, grows eight different kinds of vegetables. The raised beds are enclosed within a mesh fence, to keep chickens and other ‘pests’ out. When I visited she was harvesting spring onions and pare belut (snake gourd). When I commented on how good the fresh spring onions looked, she insisted that I take a bunch home with me. They were as tasty as they looked. Ibu Rosali is Ibu Yani’s neighbour in Habaring Hurung. She has just picked some bayam – a green leafy vegetable that is common here. Bayam is usually translated as ‘spinach’, but it’s not closely related (though both are in the Amaranthaceae family). Like (English) spinach, it’s a good source of iron in the diet. In Banturung village, Mama Putri’s daughter appears to be looking very excitedly at a freshly picked eggplant, but the truth is that she was watching some other children playing nearby. Indonesian eggplants are usually that long shape, looking somewhat like a purple cucumber. Mama Putri’s other children (though at least one might have belonged to a neighbour’s family) followed me around everywhere as I checked out the garden and took photos. 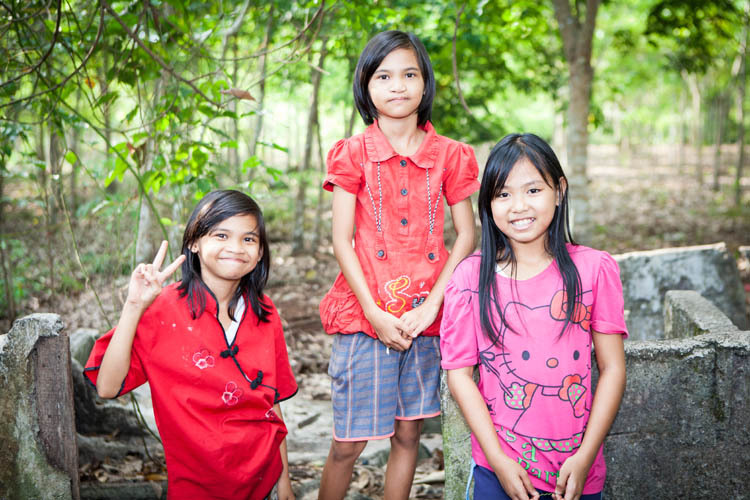 Like (almost) all children here, they wanted to be photographed too. The home vegetable garden program is well established in this district, and YUM is now encouraging the cultivation of fruit trees to further improve and supplement family diets. 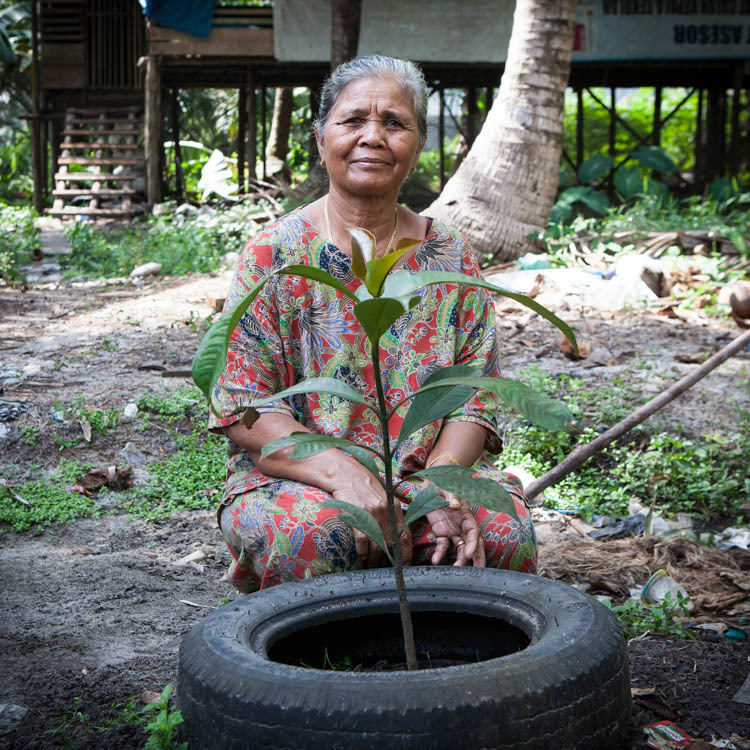 Here, Mbak Joko keeps a proud and watchful eye on her newly planted manggis (mangosteen) tree. 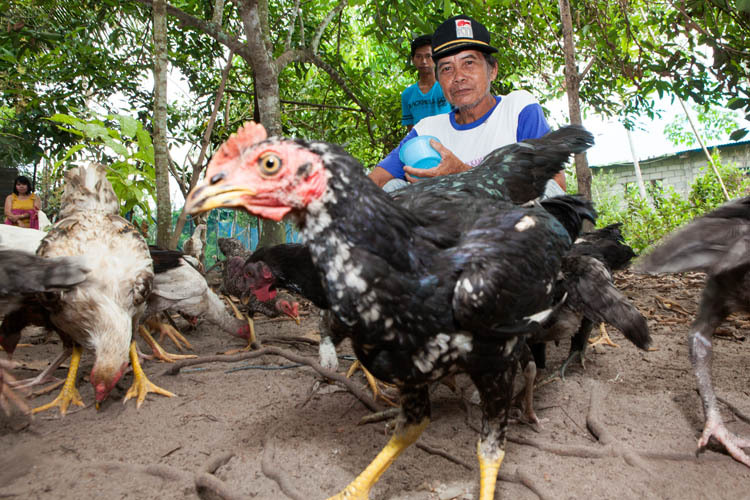 Recently the YUM Agro project has moved into the promotion of ‘small animal husbandry’ (free-range chickens and fish farming) in order to boost the dietary protein intake of families in the region. The aim is to increase the number of family meals which contain meat (chicken) from the current average of 12 per month to 30. 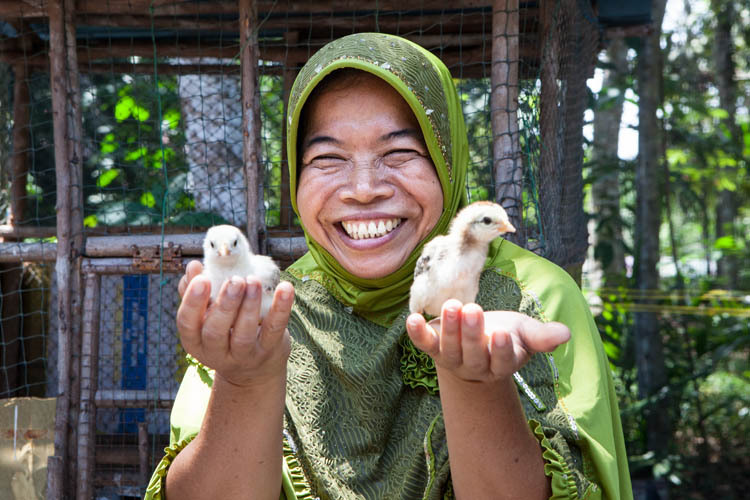 Ibu Nursiah is already a successful gardener in Marang village, but she now also has her hands full with chickens. 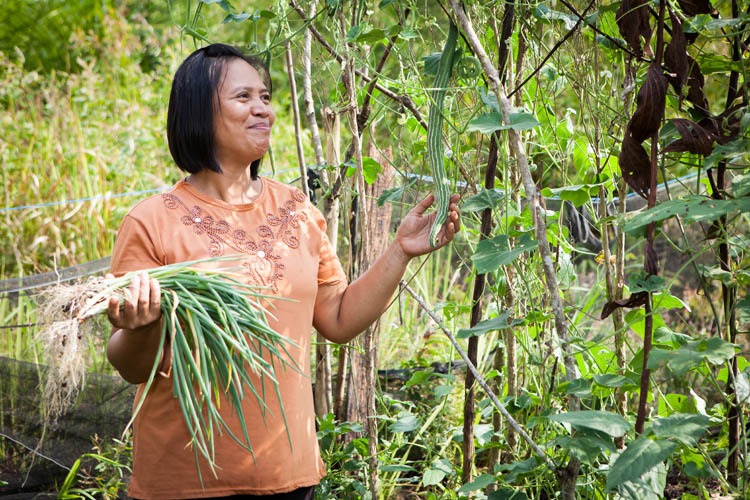 For the home gardens, experience has shown that they are much more successful when women have responsibility for them. But men are much more likely to be involved in the rearing of chickens. Pak Mispan lives in Habaring Hurung village, which is one of the new villages established a couple of decades ago to house transmigrasi settlers – in this case Javanese people who have moved to the far less crowded (and less fertile) Kalimantan. 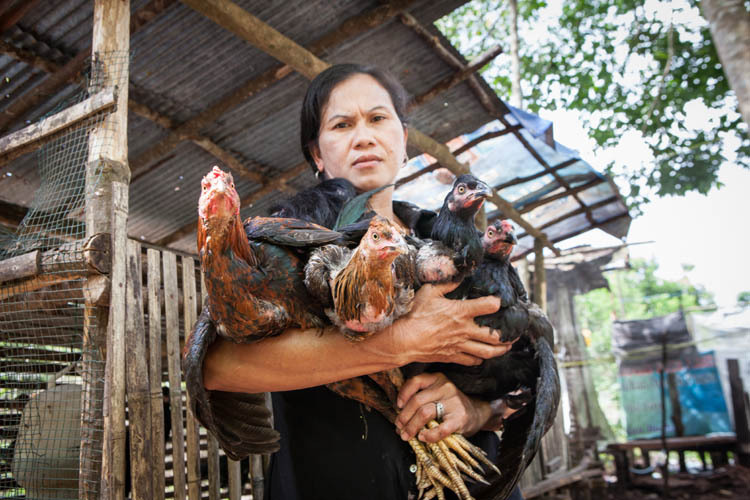 Mama Ema is also a successful gardener and small-scale chicken farmer in Marang village. Like many women, she applies a paste of rice flour (and sometimes including ground medicinal root, bark or leaves) to her face to screen her skin from the darkening effect of the sun, and to prevent skin problems like acne. In Java, apparently women only apply it at nighttime for skincare purposes. It is expected that families will have the production capacity to also sell around five chickens per month. This will provide valuable supplementation to the families’ very modest incomes. Mama Wendi (from Marang village) appears to have already chosen next month’s chickens for sale. 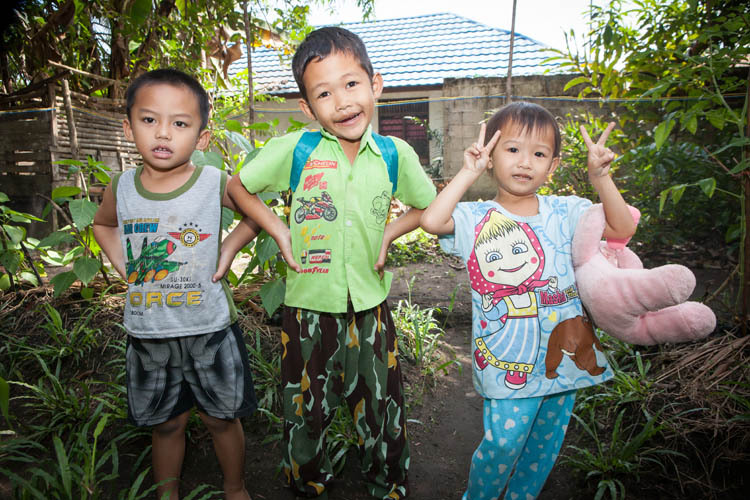 Two years ago Afandi, the boy in the photo above, was 1.5kg and 16cm below the healthy minimums for his age. 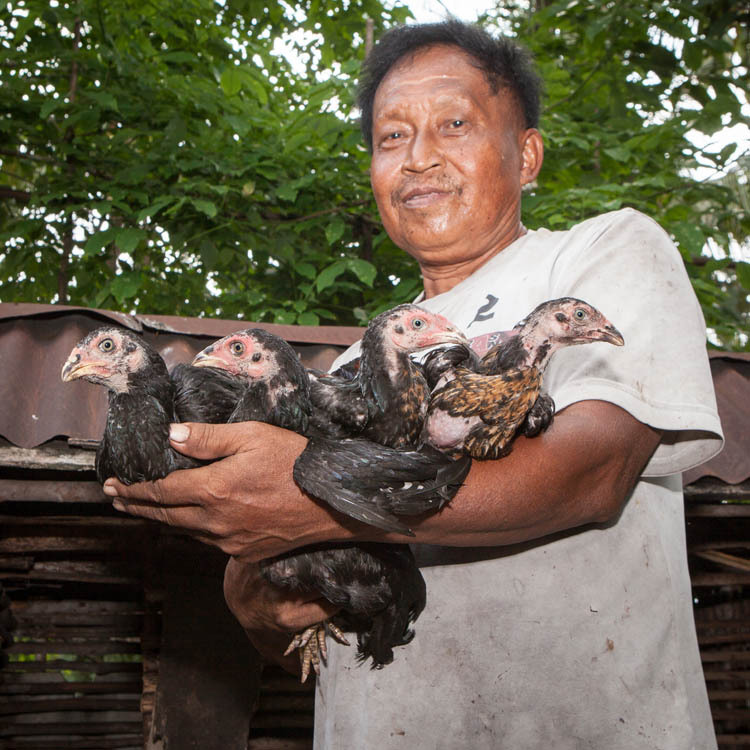 Since his mother Ibu Nurhayati joined the YUM home garden program, his growth has improved substantially, though he is still under-sized for his age. The family has now joined the YUM ayam kampung (free-range chicken) program, and it is hoped that the extra protein in his diet will further assist his growth. Ibu Tania from Banturung village has one of those smiles that you can’t resist smiling back at. 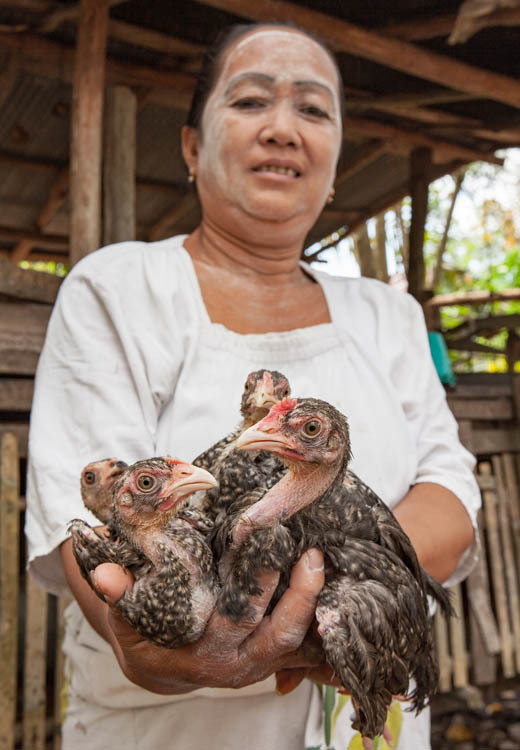 The chickens – although not actually smiling themselves – certainly appear to be happy in her care. This entry was posted in Indonesia and tagged Central Kalimantan, Kalimantan Tengah, YUM Agro Project. Bookmark the permalink.